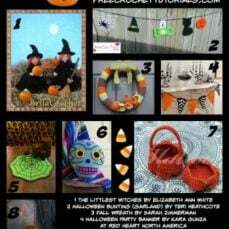 DIY Halloween Decorations: 10 Patterns You Can Crochet! This site contains advertisements and affiliate links. If you choose to make a purchase after clicking on these links I may receive compensation for the referral at no additional expense to you. Please read our full Disclosure Policy here. New tutorials are added daily – stay in the loop with our weekly newsletter. Copyright © 2019 Free Crochet Tutorials. Site Credits.Designed by Melissa Rose Design.Developed by Once Coupled.